In this southern paradise, flowers bloom all year around and you may even be able to meet exotic wild birds with blue wings. The bright sunlight pours down from the sun and the calm, glittering sea spreads out right before your eyes. 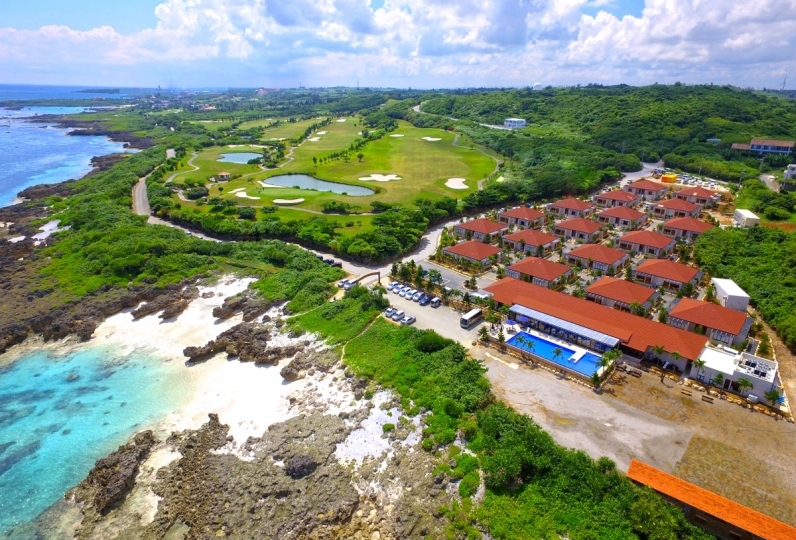 Here, at “Shigira Bayside Suite Allamanda”, you can pass the most special island time at the greatest location. All guest rooms are suite rooms with a view of the emerald green sea. There are a total of 174 rooms. You would not believe that you are at a large scale hotel with our comfortable, fine quality, resort stay. The southern island taste interior design is based on original asian furniture. Although it is a modern design, a nostalgic, calm, atmosphere spreads throughout the room. On a great 3,305,785 square meters of land, all the thrills of a resort are present. Even if you have experienced all types of luxuries, here, you may find a luxury of supreme bliss. I used it for the honeymoon, but I was very happy to upgrade and pay attention to it for free ☆ The rooms were very nice too! The breakfast buffet was of great variety and everything was delicious and very satisfying! It was very nice to be able to spend a honeymoon only once at this hotel. I would like to use it again if there is an opportunity. The service was good, it was a very pleasant stay. I hope you will be able to use it again. We stayed at Pool Villa Royal Suite. Things like bird droppings were scattered on the poolside floor, and the drainage beside the pool was filled with fallen leaves and water did not flow, so it was removed here. I received the impression that I was cleaning properly. I think that measures are being taken so that birds do not come when the net on the wall is not stayed, but it is bad and it is not bad, it is not to prevent things coming naturally but clean up and there I would like to receive correspondence. 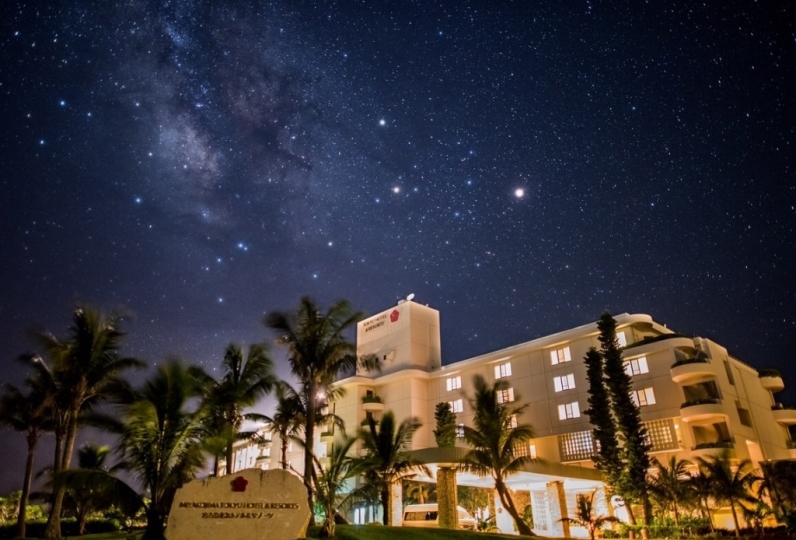 I booked an accommodation which is an expensive class even in Miyakojima on an anniversary of once a year and visited with a considerable expectation, but the Ferris Villa Suite Miyakojima Ueno who stayed the next day is one-third It was a better lodging than Allamanda by the amount. I also took a meal and used Teppanyaki from Malangunga. It was disappointing because it passed through the dark feeling room in the back rather than the luxurious room I saw in the photo so far as it was far from the one I imagined about that point. As Irabu Airport became an international airport and 500,000 people are expected to come here annually, new buildings were built at the rapid pace even on the Shigira premises, but unless we do not firmly carry out services of existing ones, customers will leave I think that I think that I will go so I think that you can take care of every corner. One of the joys of staying at a resort is the cuisine that uses local ingredients. From a dining room with a sense of freedom to a private room and even a terrace that overlooks the ocean, there are many locations to pick form. Pick one depending on your mood. An open pool side restaurant. Born from carefully picked ingredients and inspiration. Enjoy a classy, stylish Italian meal. Taking advantage of high quality ingredients, a colorful cuisine that uses Kaiseki cooking as it's base. 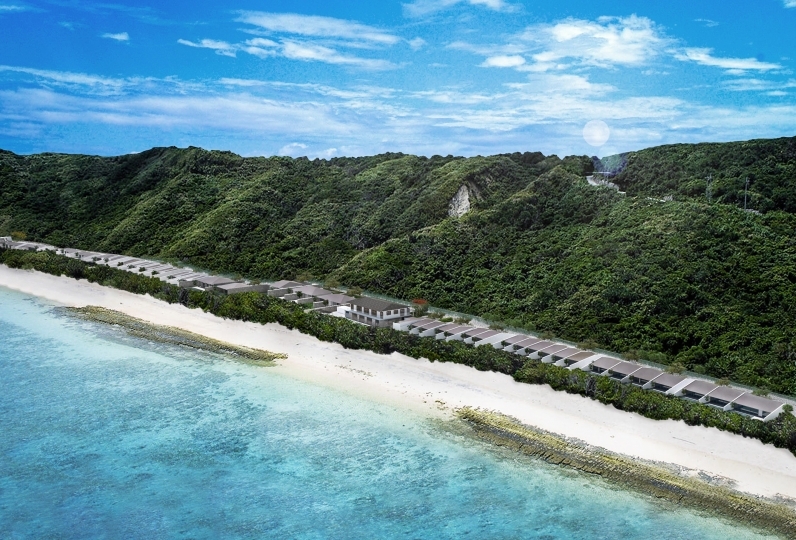 We offer Miyakojima's seasonal taste. The chef will show his brilliant skills in front of your eyes. Please enjoy the hard to obtain Miyako cattle, island vegtables, and freshly caught local seafood. An open poolside lounge. With a refreshing atmosphere enjoy coffee and brunch. In the afternoon you can enjoy a snack and cafe. Miyakojima's onsen with a great view surrounded by flowers and greenery. 50 degree Celsius water that is sprung from a 1250m underground source. A swim suit wear jungle pool that uses natural source that is available all year around. 41 degree Celsius outdoor bath. 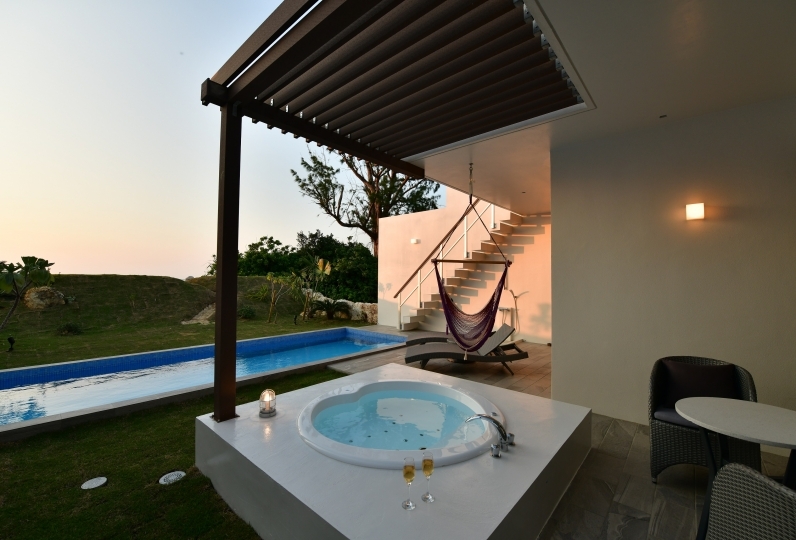 An open atmospheric bath surrounded by flowers and greenery with arranged Okinawan natural stones. 42 degree Celsius outdoor bath. Refreshing in the afternoon; At night enjoy the bath while listening to the sound of the waves. The concierge is here to provide you 24 hour support. We have a in room spa service here at Allamanda. Please contact the concierge desk. No license required. Entry is at the beach and you can enjoy a brief time. 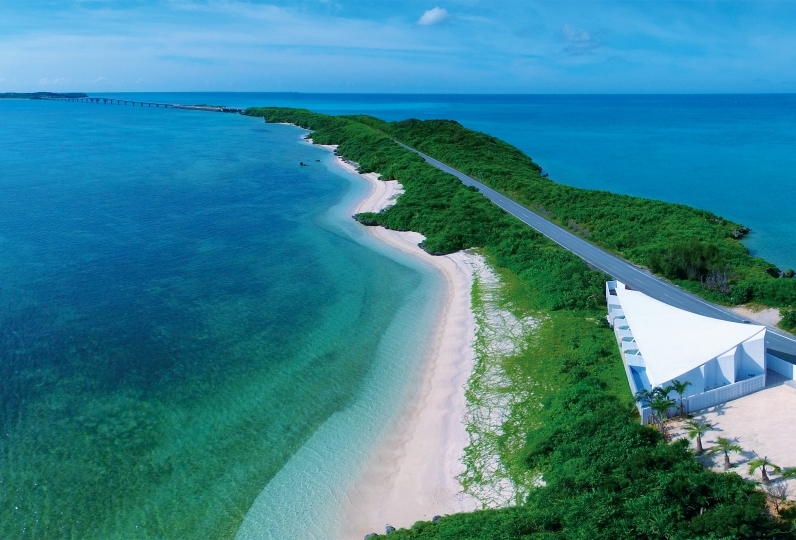 From atop the water, you can enjoy Miyakojima's nature with your 5 senses. For those who can not swim do not worry. A 360 degree panoramic experience. Enjoy the beautiful scenery of the ocean from the sky. Enjoy the refreshing wind while riding through the premise surrounded by beautiful flowers. 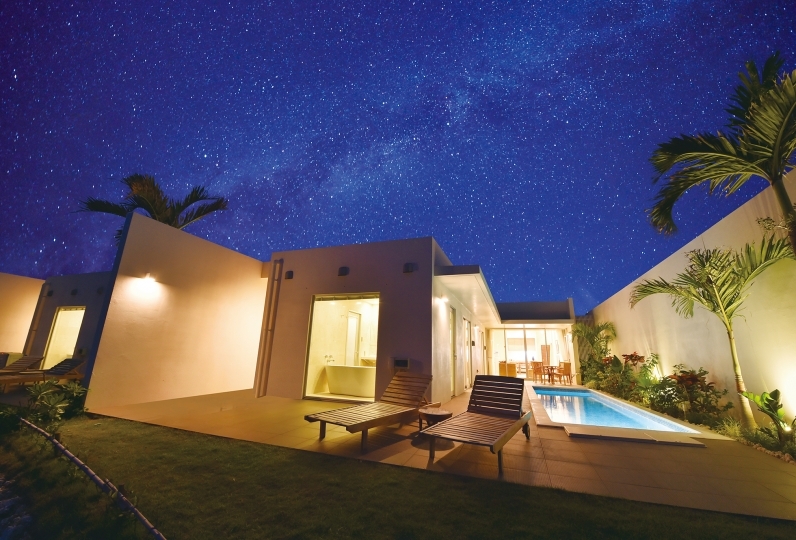 ※Pool Villa Lagoon Suite 4th floor (Top floor) is only available to customers above the age of 13. ※For customers with more than 3 people in 1 room, 1 person will have to use the day bed. ※We offer transportation from the airport to the hotel. For those who are interested please inquire the day before your stay. ※Please not that refunds due to changes in accommodations are not accepted after use. ※When paying for accommodation fee on-site, please do it during the time you check in. Only children up to the age of 11 may share beds. For those who wish to share beds, please pick the infant option (bed, no meal), and please put in the age of the child in the contact field. Ages 6~11: If using a normal bed, adult charges are applied. If sharing a bed (including breakfast and amenities), 5,000 yen. Ages 0~3: If using a bed, adult charges are applied. If sharing a bed (breakfast included) then there are no charges. *Pool Villa Lagoon Suite 4th floor (Top floor) is only available to customers above the age of 13. (*There is a shuttle bus available. If you would like to use the shuttle bus, please make a reservation by the day before. 63 of people have viewed this page within the past 24 hours.